The Colorado Convention Center (sometimes referred to as the Denver Convention Center) is located in the heart of Downtown Denver. Below are some of the reasons why the center has consistently been ranked by meeting planners as one of the most user-friendly conference venues in the U.S.
Meeting and convention attendees are welcomed as they enter the atrium lobby on the 14th Street side which has 15,800 sq. ft. of total space with spectacular views of Downtown Denver. The west side lobby on Speer Blvd. has 21,200 sq. ft. of space with panoramic views of the Rocky Mountains. In total there are seven lobby areas - one for each exhibit hall and one for the Bellco Theatre. Several of the lobby areas can be combined to offer beautiful and practical registration areas. The Speer Blvd. side has a 7,500 sq. ft. outdoor terrace protected by windscreens with a panoramic view of 140 miles of snowcapped peaks. On the 14th Street side, there is a 1,350 sq. ft. outdoor terrace with views of downtown Denver. The new Colorado Convention Center parking lot has 1,000 spaces on three levels (two of them covered), all with easy access to the center. The parking lot has a self-service paying system. There are 48 covered loading docks that can accommodate 70-foot trucks, 24 bays per side. The Colorado Convention Center has three exclusive service providers. Centerplate is the exclusive caterer for the Colorado Convention Center and proudly presents the highest level of quality catering services in Colorado. 303-228-8050. Smart City Networks is the exclusive provider of event and meeting technology for the Colorado Convention Center. Offering high-speed Internet, turnkey data networking services including local area networks, wide area networks and private networks using the latest technology. Smart City has deployed a wireless network throughout the center that offers internet access to exhibitors and attendees. 303-228-8056. SMG, the operator of the Colorado Convention Center provides all electrical and telecommunications services. 303-228-8027. 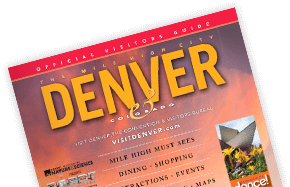 The Colorado Convention Center has three covered drop-off points for motorcoach shuttles and group transportation. The Stout Street entrance has its own Light Rail station, making it easy to travel by light rail from the convention center to all downtown stadiums and attractions. The light rail also connects downtown Denver to the Denver Tech Center hotels. All new, clear and easy to read signage is found throughout the building, making traffic flow fast and efficient.